A short and sweet oldie from the King of Rhythm, O.P. Nayyar. (I had meant to post it last week but noticed at the last minute there were glitches in the initial rip. Hopefully it's OK now). 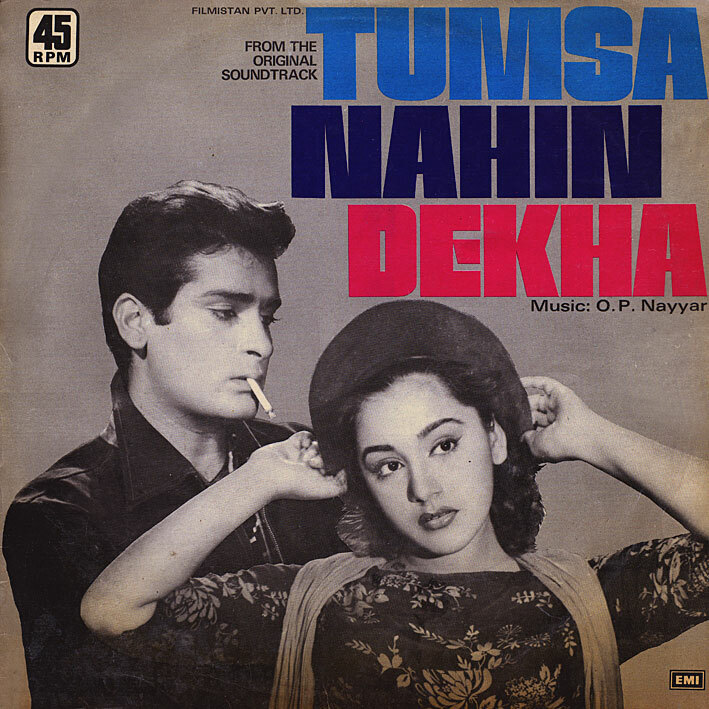 There's nothing on 'Tumsa Nahin Dekha' that amazes me in a big way, but for vintage sounding songs and nice rhythms, you could do a lot worse. Best track is the bouncy 'Aaye Hain Door Se', with 'Jawanian Yeh Mast Mast' running a close second. Thanks. Another nice one from an early Shammi film. Thanks a bunch. Keep up the great work. Oh BE STILL MY HEART. Love the cover photo! Just was curious to know that do you have Love Story, Silsila, Lawaaris, Namak Halaal, Prem Rog in your collection?